This cute I'm the Little Shirt can be printed on a onesie, tee shirt or a sweatshirt. 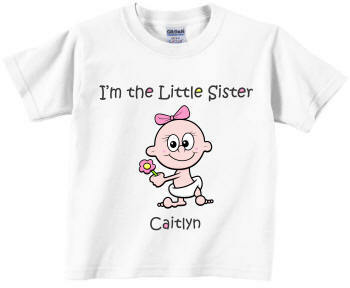 You can write any title you like, and personalize this I'm the Little Sister shirt with her first name. Makes a cute newborn baby gift. Big sister and big brother shirts are available. Shirt comes in white only. includes FIRST name if desired.